Angul: A three-year-old Royal Bengal Tiger translocated from Madhya Pradesh died in the Satkosia Tiger Reserve in Odisha’s Angul district, said an official on Thursday. The tiger named Mahavir was translocated from the Kanha Tiger Reserve of Madhya Pradesh to the Satkosia Tiger Reserve. 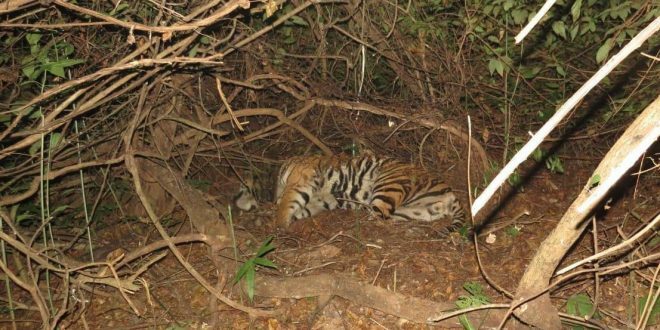 The incident occurred about 500 meters from Raigoda to Nuagada forest road inside the Nuagarh RF of Athagarh forest division which has been proposed to be included in Satkosia Tiger Reserve. “On Prima facie investigation of the carcass, a deep lacerated and 5 days old Maggotted infected wound was observed in the dorsal neck region of the tiger which may be the cause of the mortality,” said a release from the tiger reserve. “The site of incidence was not disturbed as per the NTCA protocol. Hence, the exact reason of the mortality and time of incidence will be ascertained after conducting the detail post-mortem examination,” the release said. A team to conduct the post-mortem examination of the tiger carcass has been constituted by Field Director, Satkosia Tiger Reserve comprising of government Veterinarian doctors, representative of NTCA, Local NGO and others in accordance with the SOP by NTCA. The disposal of carcass through incineration will be carried out in presence of the Veterinarian team and others by following NTCA protocol. Ramasamy P DFO, Satkosia wildlife division has been appointed by FD, Satkosia Tiger Reserve as Investing Officer to cause detail enquiry into the matter and for initiating the further course of action. Notably, Sundari, the tigress from Bandhavgad in Madhya Pradesh, was tranquilised on November 6, following public outrage after it purportedly mauled two persons to death. Following a sharp decline in the number of Royal Bengal tigers in the state, the Odisha government had picked Satkosia Wildlife Sanctuary for raising the population of the big cats.